It's become more common for teammates to pester MLB players doing in-game dugout interviews, but that doesn't make this instance with Indians pitcher Corey Kluber any less amusing. There were three stages to the attack. First, the dugout starts with the routine sunflower seeds. The microphone catching the thump of the seeds as they hit Kluber makes it funnier. 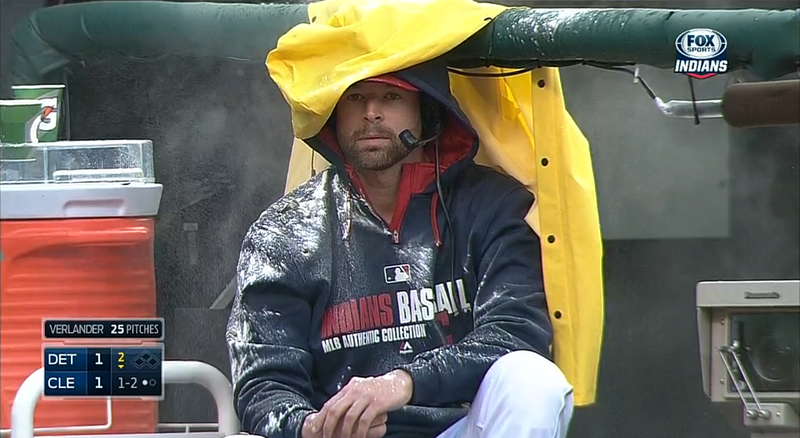 Kluber then gets sprayed with water, eventually receiving partial shelter from a raincoat thanks to a nice person. Kluber impressively keeps his composure the entire time. Good job, Corey!